The image you appraise in the bathroom each morning is, of course, reversed, a doppelganger of the real you, a you flipped, a self inverted. A non-reversing mirror is a mirror that reflects your true image—that is, how others see you everyday. Anyone can make a non-reversing mirror. Via ever helpful wiki: "Connect two regular mirrors at their edges at a 90 degree angle. If you position the join so that it is vertical and look into the angle,"
you will see a non-reversed image of yourself. You sometimes see this in public toilets where there are mirrors on two walls which are at right angles. Looking towards the corner, you can see such an image. The problem with this type of non-reversing mirror is that there is a big line down the middle interrupting your view. 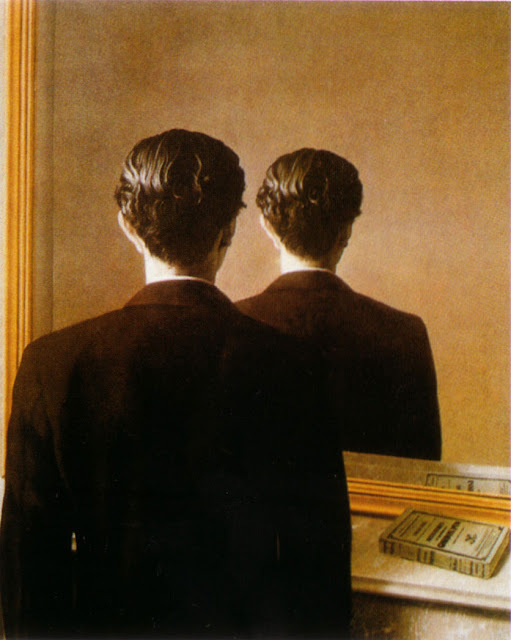 I've been thinking about the non-reversing mirror in relation to the autobiographical essay. Any essay reflects, sifts the past and present through the imagination in an attempt to discover what Vivian Gornick calls "the larger sense." A writer makes this sense, Gornick is quick to clarify, doesn't simply find it beneath a bramble of memories or half-baked ideas. The root of the word "art": assembling, putting together. The reflection in an essay is two-fold: I reflect as I reflect. Do I assemble a non-reversing mirror when I write an autobiographical essay? Do I essay the self that I recognize, or the self that others recognize. It's a tricky game. If an essay is a mirror, I want it to be non-reversing. I want it to reflect back a self shorn of habit, tic, and indulgent self-histories, though that may be impossible. Perspective: when I was a kid on a Saturday night my parents were out to dinner and I was being looked after by my older siblings. Slithering around on the tile floor of the rec room, playing "snake," I cut my face on the edge of a table, gouging an inch-long cut above my ear. My parents were called home; luckily, no stitches were needed. Suburban child trauma narrowly missed. When I recall this event, idly or in earnest, the memory shifts between first- and third-person, a high-angle shot of me snaking inevitably, stupidly, toward that table edge, a subjective shot of the table edge looming in front of me as I approach. At some point in our recalling—perhaps moments after an event, perhaps over years—we translate a first-person POV into a third-person, wishing to see ourselves as members of a dramatic tableaux. (Freud discusses this in part in his "Screen Memories" in The Uncanny.) Why the shift in perspective? Is it because we don't trust a memory unless we dramatize it, watch it playing out, its characters and setting interacting within a sanctioned "event"? Even if I'm alone in a memory, I seem to recall it with impossible omniscience, a God's-eye view that places me in a kind of context that's larger than myself. Is it because we long to wrench ourselves from the tyranny of the subjective, to watch ourselves as members of a dramatic cast, as others see (and acknowledge) us? In the non-reversing mirror of memory, we get it both ways: what I saw, what they saw: a portable, ongoing, heavily-edited, micro-movie machine that I crank and where I'm both star and director, both "I" and "he." Ah: that black line down the middle of the jury-rigged mirror says, it's one or the other. Anyway, read David Lazar's "Three Fraternal Aphorisms" in The Body of Brooklyn. Then look in a mirror. It's weird that you wrote about this. In an effort to reduce the amount of paper I have in my office, I've been slowly scanning all my work and notes and such from college (and even high school -- eek). I recently came across some notes from The Body of Brooklyn about using a mirror to see yourself, and thoughts of this very same nature have been bubbling around in my head ever since. Do you still use Body of Brooklyn? Hah, serendipity. I use BoB on and off. I've been teaching essays from his Truth in Nonfiction book lately. Good stuff. Cool site! Looking forward to checking it out more! previouslylovedplaces:Astoria, Ohio by cziffra1 on Flickr.